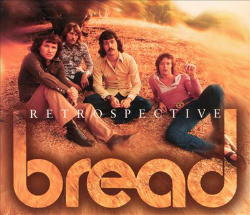 In their own understated way, Bread defined the sound of the early 1970s as much as any group of their era. Anyone who tuned in to U.S. Top 40 radio during those days couldn’t help but hear their signature songs: “Make It With You,” “It Don’t Matter To Me,” “If,” “Baby I’m-A Want You,” “Everything I Own,” “The Guitar Man.” Bread was a staple on the AM airwaves well into the middle of the decade, purveying a romantic variety of pop rock that was unmistakably their own. Their music was an appealing counterpoint to the harder-edged rock and R&B of the Nixon/Ford Years, earning them an impressive string of certified gold albums and singles. Smoothly blended vocal harmonies and finely crafted songwriting were the essential ingredients that went into the making of Bread. Founding members David Gates, James Griffin and Robb Royer brought considerable talent and experience to the group when it was launched in the summer of 1968. With the addition of drummer Mike Botts and bassist/keyboardist Larry Knechtel (who replaced Royer in 1971), the level of expertise increased still further. A close listening to their work reveals much subtlety and attention to sonic detail. Bread emerged at a time when pop music was veering away from psychedelic excess and toward more acoustic-based sounds. Homespun combos like The Band and Crosby, Stills & Nash brought the decibel levels down and emphasized words and melody once again. Bread’s music had a similar slant, though its members’ songwriting roots were more in mainstream pop than rock ‘n’ roll. Bread was always more complex than its easy-flowing, unabashedly sentimental hit singles would indicate. As time went on, Gates took the spotlight as the group’s balladeer par excellence, while Griffin and Royer (who generally wrote songs as a team) tried to pull the band in a quirkier, more upbeat direction. It didn’t help the group’s team spirit that Gates’ ballads – beginning with the chart topping “Make It With You” in 1970 – were accepted by radio programmers, while Griffin’s more rock oriented tunes did less well. This divergence eventually undermined Bread’s unity and contributed to their initial breakup in 1973. Looking back, it’s fair to say that Bread was more than the sum of its ingredients. While the solo work of Gates and Griffin had merit, it could not duplicate the chemistry of the group (even if that had been the goal). Bread was never an underground band and was meant to be a radio-friendly, commercially successful venture from the start, but there was an elusive magic to their best moments that went beyond mere craftsmanship and calculation. A certain amount of ego-clashing and artistic disagreement within the group was probably inevitable. In the end, Bread may have been a case of too many cooks (or bakers) for one band to handle. All three founding members had pursued individual music careers prior to joining forces and brought their own particular strengths to the partnership. Moving to Los Angeles in the early ‘60s, he quickly became an in-demand musical jack-of-all-trades. His best known credit as a writer/producer was The Murmaids’ 1963 hit “Popsicles And Icicles”; he also placed tunes with The Monkees, Johnny Burnette, Shelly Fabares, Connie Stevens and others. His assignments as an engineer were even more diverse, bringing him projects with Glenn Yarbrough, Merle Haggard, Buck Owens, Bobby Darin, Pat Boone, and Rod McKuen, to name only a few. His involvements ranged in extremes, from production work with avant-garde rocker Captain Beefheart to the founding of a short-lived R&B label, Planetary Records. Gates kept busy behind the scenes throughout the decade, though he continued to dream of making his own records as an artist. Griffin was also active in the L.A. music scene at this time. He had relocated from Memphis in 1962 and scored a recording deal with Reprise soon after. He released a cover version of Lennon/McCartney’s “All My Loving” in ‘63, followed by an album, Summer Holiday. None of Griffin’s releases on Reprise or, later, on Imperial and Viva had much impact on the national charts. Still, he enjoyed some success as a songwriter, placing tunes with artists as disparate as Lesley Gore, Bobby Vee, Ed Ames, and Rudy Vallee. By 1967 Griffin was co-writing songs with Royer, an L.A. native who had begun his career as a folk guitarist. Switching to rock, he helped to launch Pleasure Faire, a Mamas & Papas-esque outfit that recorded an album for Uni Records in 1967. The group’s producer was none other than Gates, who also contributed some uncredited vocal parts as well. When the Faire broke up a year later, Royer remained in touch with Gates as he developed his songwriting partnership with Griffin. The still-unchristened combo didn’t have to wait long before securing a record contract. Prominent entertainment attorney Al Schlesinger brought the group to the attention of Elektra Records founder Jac Holtzman, who sent them into the studio to cut some demos. He was pleased with the results, and the deal was finalized by the beginning of 1969. “Look At Me” is a haunting waltz-time vignette by Gates, foreshadowing such later ethereal Bread ballads as “Diary” and “Aubrey.” “It’s just another of my moody pieces, not based on any particular individual or circumstances,” he says. This assignment led Karlin to request Griffin and Royer’s lyrical help on another musical piece, intended for the film Lovers And Other Strangers, starring Gig Young, Bea Arthur, and a young Diane Keaton. The pair obliged and the finished work was titled “For All We Know.” Griffin recorded a demo of the song in March 1970, accompanied by Royer and session player David Cohen on guitars. For publishing reasons, Griffin and Royer used pseudonyms (Arthur James and Robb Wilson, respectively) in their songwriting credits. “For All We Know” was performed by singer Larry Meredith in the film – but, more important, the song was then covered by The Carpenters, who turned it into a #3 hit in 1971. “For All We Know” went on to win an Academy Award® for Best Song and remains Griffin and Royer’s most successful collaboration. Composed and sung by Gates, “Make It With You” marked a turning point in the band’s fortunes. “I got goosebumps while I was writing that song,” he confesses. “I knew that I was onto something, that it was better than the run-of-the-mill song, but I had no idea that it would do as well as it did. It was the fourth song that we started for the album, and as soon as Elektra heard it, they wanted to put it out immediately. We had to sprint to the finish line to complete and release On The Waters so we could take advantage of ‘Make It With You’ being such a big single. “Make It With You” became the prototype for further Bread ballads to follow, though it would remain their only #1 single. All told, the song enjoyed a 17-week run on the singles charts and sold over a million copies. Going toe-to-toe with the likes of Grand Funk was not in the cards, however. Rather than get behind another On The Waters track as a single, Elektra released Gates’ “It Don’t Matter To Me” as the follow-up to “Make It With You.” This empathetic ballad first appeared on Bread’s debut album in somewhat different form. David tells its history thus: “I wrote that song a year or so before joining Bread, mostly for my personal pleasure. I thought it would be good for the group – it has this unusual bridge that takes off and does some crazy things musically. The version that we did for the first album was in the key of E, much faster and without strings. About a year later, when we were looking around for a song to follow ‘Make It With You,’ I said, ‘Let’s go back and do “It Don’t Matter To Me” the way I really wanted to do it.’” The re-recorded version of the song reached #10 in late 1970 and was included on The Best Of Bread (1973). Still, Bread didn’t neglect their up-tempo tunes altogether. “Let Your Love Go,” Manna’s first single, found Gates delivering a credible rock vocal performance. “We thought it was a great radio song,” he says. “It was a lot of fun to do live, and we opened our shows with it for a long time.” Unfortunately, “Let Your Love Go” fizzled out at #28, underscoring the perception that Bread could only make the Top 10 with ballads. Manna continued the gold certification streak that began for Bread with On The Waters. It was also the last album to feature Royer as a bandmember – by the fall of ‘71, he had exited the group as a player, though he continued on as Griffin’s songwriting partner. For his replacement, the group recruited bassist/keyboardist Larry Knechtel, one of the West Coast’s top rock sessionmen. Born in Bell, California, Knechtel was actively performing with combos in nightclubs by his late teens. His early involvements included stints in bands with twang-guitar king Duane Eddy and R&B pioneer Johnny Otis. By the mid-‘60s, his multi-instrumental expertise had brought him to the front ranks of L.A.’s session elite. His sure touch on bass and/or keyboards can be heard on such tracks as The Doors’ “Light My Fire,” The Byrds’ “Mr. Tambourine Man,” Mason Williams’ “Classical Gas,” and all of the hits by The Mamas & The Papas. Knechtel’s exquisite piano playing on Simon & Garfunkel’s “Bridge Over Troubled Water” may be his most famous studio credit. Baby I’m-A Want You (1972) was the first album to feature Knechtel’s contributions and may be Bread’s best-realized work overall. There’s a more consistent sound here, making Griffin’s blues-rock pieces and Gates’ mid-tempo tunes seem less far apart. It also became the only Bread album to yield four Top 40 singles. Bread started off 1972 with the release of “Everything I Own,” among the more personal songs Gates has recorded. “That was written in memory of my father,” he explains. “I worked on the lyric so that it could be taken in a general sense and not be real obvious. I didn’t tell anybody the story behind it for about two years after the record was out, and then I started telling audiences, and it made quite a bit of difference. Recording the song went really well – I was quite motivated to get that one done right. Larry played a real interesting and complicated part on the harpsichord. And we doubled the kick drum to get that thick sound. I just tried to put as much emotion into it as I could.” “Everything I Own” charted at #5 and went on to become hit material for reggae artist Ken Booth in the ‘70s and for Boy George in the ‘80s as well. Gates describes “Yours For Life” as “sort of a country song about permanence in a relationship, making a commitment, that sort of thing. But once again, it’s not a real, real serious song.” In concert, Gates and Griffin would do this tune as a duet, sharing vocal harmonies while playing acoustic guitars. After four gold albums and nine Top 20 singles, Bread crumbled and its members embarked on separate careers. The year 1973 was rife with solo singer/songwriters releasing albums, and Gates and Griffin both joined the fray by the end of the year. Gates’ solo debut – appropriately titled First – was fairly similar to his work with Bread, though the production approach was more stripped down. “I saw going solo as a continuation,” he says. “I had been producing and arranging the Bread albums and writing my percentage of the songs, so it didn’t seem very different to me. But I did try to have a little more flexibility.” Participating in the First sessions were Breadmates Knechtel and Botts, along with drummer Jim Gordon (who had played on the Bread debut LP), guitarist Louie Shelton, sax player Jim Horn, and other West Coast session notables. The expansive “Clouds” was the first single, taken from a lengthy suite heard in its entirety on the album. “That song came out of all the time I’d spent flying,” says Gates. “I’d flown a great deal, and I found it really pretty up there, looking down on the clouds. But it also had to do with traveling and being away from home so much.” Despite its airily appealing melody, “Clouds” only rose to #47. “I Use The Soap” is a buoyant country ditty with a lost-love theme. “We recorded that with an acoustic Earthwood bass,” he recalls. “It looks like a big guitar, and Larry Knechtel played the heck out of it. It didn’t fare real well as a single, but it’s a fun song.” Country singer Joe Stampley enjoyed some success with a cover of the tune a few years later. Gates was disappointed that First failed to reach a wide audience. Undaunted, he released his Never Let Her Go album in 1975. The album’s title tune attracted some attention, reaching #29 as a single. “That song comes from my pre-Bread days,” he points out. “I’d written it back in 1964 and had forgotten about it. It had been recorded back then by Gwen Johnson, an artist I was producing for RCA at the time. Years later, I was looking through my archives for some tunes, and I stumbled upon it again.” Another key Never Let Her Go track, the moody “Part-Time Love,” later became an R&B hit for Gladys Knight. Meanwhile, James Griffin had stepped out as a solo artist as well. His Breakin’ Up Is Easy appeared on Polydor in 1974 and continued in the eclectic vein of Griffin’s work with Bread. One track, the Griffin/Royer tune “She Knows,” was taken from an unreleased Bread session and featured Knechtel on electric piano and Gates on bass. The song was later covered by Ray Charles and The Band. During this period, Knechtel had returned to session work while Botts joined Linda Ronstadt’s band. Besides co-writing with Griffin, Royer pursued screenwriting and worked on a never-produced musical. Released in early 1977, Lost Without Your Love was more of a return to Bread’s essentials than a groundbreaking effort. “Hooked On You,” for instance, is a coy mid-tempo number reminiscent of “Sweet Surrender.” Gates remembers writing this song for James to sing, though he ended up handling the lead vocals himself. “The Chosen One,” another Gates song, simmers along to a sultry groove. “She’s The Only One,” a Griffin/Royer tune sung by James, ventures into country-rock territory. “Lost Without Your Love” became a #9 single, though its follow-up, “Hooked On You,” only managed to creep up to #60. The album was certified gold, but its performance was not enough to justify continuing further. By the end of 1977, Bread had called it quits for a second time. From there, Gates took on an assignment to write the title song for The Goodbye Girl, a Neil Simon film comedy starring Richard Dreyfuss and Marsha Mason. It happened this way, he recalls: “I had the melody already, and then I got the call to go see this film. I came back to my ranch, and I wrote the song while driving around on the tractor. I’d been hoping to find lyrics for this melody anyway, so it was very good timing.” Dean Parks, who had served as guest guitarist on Bread’s 1977 tour, played on the “Goodbye Girl” track. In conjunction with the success of the film, “Goodbye Girl” became a #15 hit in early 1978. This led to the release of an album by the same title, which contained both new material and tracks from Gates’ first two solo LPs. Among the freshly recorded tunes was “Took The Last Train,” a lighthearted excursion into the outer fringes of disco. “I love that song,” Gates says of “Last Train.” “I worked on it with Larry Knechtel up at his place in Washington – he wrote the bridge for me and helped me with the chorus. I didn’t do it fast enough, though – if I had recorded it at a faster tempo, I think it would have been much more successful.” As it turned out, the song chugged up to #30 as a single. Falling In Love Again (1979) was a respectable effort, featuring the #46 single “Where Does The Lovin’ Go.” Gates describes this tune as “kind of a negative lyric set to a rather happy, upbeat melody…those types of things happen sometimes, musically.” A year later, he switched labels from Elektra to Arista and released Take Me Now. The title track from this album reached #62. Griffin maintained a good amount of visibility during the 1980s. After the 1977 Europe-only release of a second Polydor album, James Griffin, he recorded several singles for the small Memphis-based label Shoe. From there, he moved back to Los Angeles and joined forces in 1986 with Randy Meisner (ex- Poco and Eagles), Blondie Chaplin (a former Beach Boys sideman), and singer/songwriter Billy Swan to form Black Tie. This unit had some success on the country charts in the early ‘90s, particularly with a cover of Buddy Holly’s “Learning The Game.” At the same time, Griffin was a member of another country group, The Remingtons, which released two albums and gained airplay with such songs as “Two-Timin’ Me.” In addition, he earned hits as a songwriter with Conway Twitty (“Who’s Gonna Know”) and Restless Heart (“You Can Depend On Me”). This country connection is no accident – much of what Bread recorded in the ‘70s anticipated the direction that country music took during the late ‘80s and ‘90s. By 1994, Griffin, Royer, and Knechtel all found themselves in Nashville and began performing at local clubs together as Toast (ouch!). On his own, Knechtel has remained active as a sideman (recording and touring with Elvis Costello among others) and has released an instrumental album, Mountain Moods (MCA, 1988). Concentrating on songwriting, Royer has scored a pair of notable successes: “Quittin’ Time” (a hit for Mary Chapin Carpenter in 1988) and “Sold” (a #1 country smash for John Michael Montgomery in 1995). As for Gates, he resurfaced in 1995 with his CD Love Is Always Seventeen, which yielded a well-received single by the same title. A recent tour done with country singer Billy Dean pointed towards a higher profile in the near future. David Gates and his band mates may have been known as the kings of soft rock during their glory years, but their accomplishments remain solid into the present day. Their music was built upon the firm foundations of expert songcraft and tempered by the contrasting personalities of the group. The Bread sound has stayed remarkably fresh, offering a taste of pop-rock romanticism that still goes down easy. Special thanks to: David Gates, James Griffin, Fred Karlin, Larry Knechtel, and Robb Royer. 10. SHE KNOWS – James Griffin & Co. NOTE: Numbers in italics (following original single release information) denote peak positions on Billboard’s “Hot 100” and “Easy Listening/Adult Contemporary” charts respectively – courtesy BPI Communications and Joel Whitburn’s Record Research Publications. All Songs by David Gates Published by Colgems EMI Music Inc. ASCAP (1969-1972) & Kipahulu Music Co. ASCAP (1972-1981), except “Goodbye Girl” Published by Kipahulu Music Co. ASCAP/WB Music Corp. ASCAP. All Songs by James Griffin/Robb Royer Published by Candlewyck Music BMI/RobRoy West Music BMI, except “The Last Time” & “Friends And Lovers” Published by Warner-Tamerlane Publishing Co. BMI & “For All We Know” Published by MCA Inc. ASCAP/EMI Al Gallico Music Corp. BMI/Music Corporation Of America BMI. “Down On My Knees” Published by Candlewyck Music BMI/RobRoy West Music BMI. “Just Like Yesterday” Published by Candlewyck Music BMI. “Fancy Dancer” Published by Candlewyck Music BMI/Bo-Brah Music ASCAP. NOTE: Numbers in italics (following original album release information) denote peak positions on Billboard’s “Top LPs” chart – courtesy BPI Communications and Joel Whitburn’s Record Research Publications. Original Sound Recordings (P) 1972, 1973, 1974, 1975, 1976, 1977, 1978 & 1979 Elektra Entertainment Group, produced under license from Elektra Entertainment Group, except “She Knows” (P) 1974 PolyGram Records, Inc., under license from PolyGram Special Markets, a Division of PolyGram Group; “Take Me Now” (P) 1981 David Gates, licensed from David Gates; “For All We Know” (P) 1996 Fred Karlin, licensed from Fred Karlin. This Compilation (P) 1996 Elektra Entertainment Group. Hey there. I am the guy they call John Sperling, and I work in the Art Department. We make art. Art for albums, art for posters, art for calendars, art for T-shirts, brochures, and displays. Besides me, our talented and hard-working crew includes Sevie Bates, Rachel Gutek, Nancy Hopkins, Bryan Rackleff, Coco Shinomiya, and Julie Vlasak, design pros all. We like to make things look good so you will feel special…because you are. This Compilation (P) & © 1996 Elektra Entertainment Group. Manufactured & Marketed by Rhino Records Inc., 106635 Santa Monica Blvd., Los Angeles, CA 90025-4900. Printed in U.S.A.
What your mama didn’t tell you, and what we want you to know is, you could be Shopping For A Better World. Every time we step up to a cash register, we vote. If you want your purchases to reflect your principles, you should know about Shopping For A Better World. This publication of the Council on Economic Priorities rates 186 companies that make 2,400 brand name products on 10 social issues. You can use it to help you select products made by companies whose policies and practices you support. So the next time you’re checking out a product for quality and price, why not also check out the social performance of the company behind the product? Turn your shopping cart into a vehicle for social change.